The vision of “Drywall Repair Gardena” is to see smiling clients and elegant properties. In the hands of our expert professionals, your home and office will look like no other. We do have specialized technicians for new drywall installation but behind them stands a great team which makes the right preparations before old walls are removed and the structure of your house changes. We ensure the best home lifting with our services because we pay attention to all building codes and special requirements of your own property before we even consider thinking of solutions for the client. In our hands, your home will not just be another beautiful home but also a safe one. Everything starts with you and us around a table. When the client approaches us, we approach back. We like to listen of your plans in order to prepare a professional drywall drafting. Our technicians pay extremely high attention to safety regulations and the structure of your home, then they start searching for ideas and building up a smart plan for you. Planning drywall home remodel is not always easy, but when you have such great professionals around you, nothing can go wrong. We are the best in what we do because we take into consideration details to ensure your safety. Rest assured that our products are of the highest quality. We don't take chances with products of questionable quality. As drywall repair experts, we know well that details such as this can make a huge difference. We don't only invest in top quality drywalls but also ecofriendly coatings. We do our best to shield the health of our client with products that comply with all safety regulations. Our competence as drywall installation specialists is beyond compare. We install drywalls with windows or for internal use, as partitions and as ceilings. The significant part of our job is the actual installation. 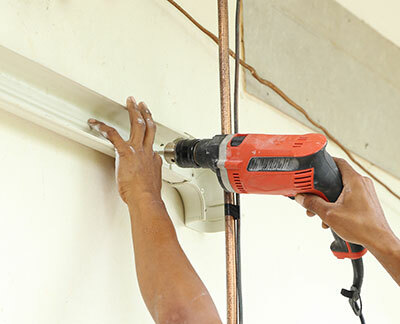 The techniques used by the teams of Drywall Repair Gardena are modern and efficient. We make sure the panels are joined together with the right taping compounds and taping is done correctly so that you can avoid stability problems and cracked drywall corners. We make sure the panels are nailed well on the studs and give special attention to the joists of the roof so that the new ceilings will be stable and safe. We follow the right steps and proceed with our work by sticking to rules and the proper procedures. Despite our drywall experience, it never hurts to be extra careful. That's why you should trust us for new drywall installation and expect fabulous results technically and aesthetically speaking. Call us for questions!